Yummy goodness. Straw yellow with green reflections, it was slightly petillant (bubbly), and after the bubbles exploded in your mouth, the palate was totally dry and pleasently herbal. Tasted just like ripe yellow delicious apple with some lime squeezed over it. Very light: alcohol content is only 9%, so I quite happily drank half the bottle at our Blues on the Green picnic and drove home (don’t tell) with no ill effects. Exactly what I was looking for in a picnic wine! This was lovely with our meal: gazpacho, green salad with feta, and a tortellini pasta salad with artichoke hearts. Also gracing the blanket: a rosemary sourdough bread, some aged manchego, and summer fruits. I also look forward to drinking this wine with seafood, fish, or a lemony grilled chicken. It’s really a good pair for almost any summer dish, with the possible exception of barbecue. In fact, this Famega is made of three grapes I’ve never heard of: Asal, Avesso and Pederna; who knew? As in many older, smaller wine regions in Europe, there are a number of grapes that winemakers are permitted to use if they want to call their wine Vinho Verde, all of which are local varietals. Oddly enough, there is also a red version of Vinho Verde, which is evidently very chewy and tannic. The name of the region, which translates as “Green Wine,” refers not to the color of its wine but to the herbal quality of the wine traditionally made here. The region is at the very northern end of Portugal, north of where they grow the grapes for port wine. 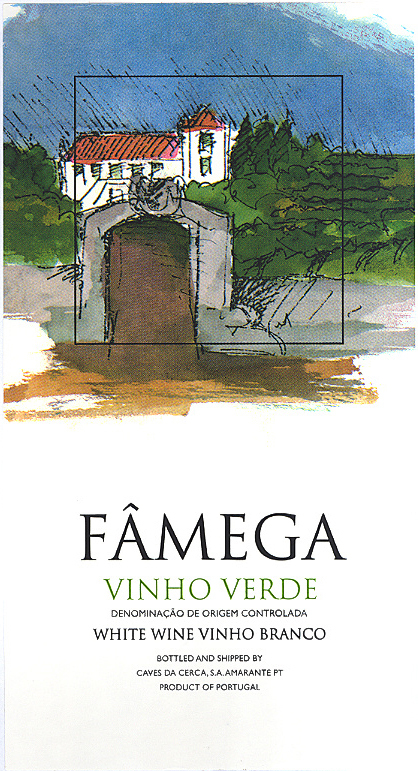 Vinho Verde has been its own region since the torn of the last century, so it’s got a strong sense of self. It’s growing in popularity in the US, riding on the coattails somewhat of Albarino and Riax Baixas, just over the border in Spain. Vinho Verde: it’s lighter than table wine, it matches with everything you’re eating this summer, and it’s ridiculously cheap. Chase some into your glass right away, because summer’s almost over. Wow, I just tasted this recently and ordered some for our store before I stumbled upon your post. Curious: did you find the wine yeasty at all? In addition to the frizzante element, I also noticed a toast/yeast flavor that I found very odd but pleasing. This wine is a major bargain, to boot!